By Phenyo Molefe: Given Tyson Fury’s previous bouts, recent outbursts and the clear articulation of his goals; one would not be at fault to believe that we were about to witness Tyson unleash punishment on an ‘ill-prepared’ but proven Kevin Johnson. Tyson had to make a statement. In the opening round, Fury jumped on Johnson with some jabs to the body not giving him sufficient time to find his footing. It looked like we were about to see a new and revised Fury as he presented movement and a variation of punches from all angles. He moved with improved fluidity, comfortably establishing his range and following through with some meaningful combinations. The second round, begun with the near feverish pace with which Fury had ended the last round. Fuming with a blizzard, setting the jab on a stinger as he pelted Johnson’s body with little restraint. Johnson did have a little success when he pinned Tyson in the corner for a moment or two; however Fury replied with a pivot setting pressure back on Johnson with some telling hooks. He was definitely boxing well and grew in confidence, taking firm control of the bout. However to our disdain, Fury’s corner continued to unveil instructions which rendered our hopes of greater engagements, void. In the third round, the action seemed to have been shifted a gear down and we were burdened with an abundance of inactive moments. Tyson was not throwing combinations with as much menace as he was in the second round. Although Fury temporarily switches to southpaw as he did for Rogan, Johnson is unfazed by the tactic and further openings remained veiled. Fury still remained in control of the fourth but Johnson was granted further opportunity to get involved. It appeared that Fury was growing tired, had the blazing start drained his stores. This was a lacklustre round and small contingent were in chorus already voicing their displeasure. Johnson came into form in the fifth round, throwing double jabs with more success. I felt like casting coals under Fury in order to inspire him to a far more convicted approach. Although Tyson largely remains in control of the bout, there is nothing to suggest anything special is about to be unleashed. We were permitted some reprieve to see him better engaged in close quarters throwing more body blows but it is not enough to quell our restlessness. Fury begun the sixth round like he was intent on resuming his blazing array of punches from the first and second round. He landed some bombs while Johnson continued to plod forward but remained a marginally illusive target. This proved to be one of his more purposeful rounds. I would prefer Fury to be more active even in this new restraint he is showing, I see lapses in his assault. 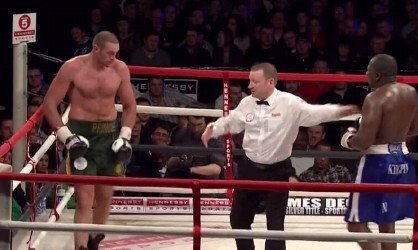 Fury launched a mammoth left hook to open up the seventh round as he walked Johnson down while throwing some hail marys; his frustrations led to a point deduction. However I was not bothered by the point deduction just relieved to see Fury re-engaging with a greater sense of purpose. The eighth round did elicit some smiles from the crowds as Fury raised both hands congratulating himself on a worthy combination well executed. He is definitely in control of the contest and without doubt Johnson is not doing much to engage and perhaps this is what has allowed him to remain standing. Nothing of notable mention occurred in rounds 9 and 10; the pattern repeated itself and although Fury was active, he should have been throwing more combinations. While illusive, Johnson was slow and an increased volume of punches would have been fitting. The crowd remained restless and showed little restraint as they jeered. The eleventh round would welcome Fury throwing some meaningful punches. He landed some impressive combination and engaged his hooks. Good to see him digging punches to Johnson’s body. Head work was followed with some shots to the body, as he tried to part Johnson from his senses. Tyson warms his jab to begin the final round, where his engaged his tool of choice at will, however opportunities to throw the straight right were either missed or unfound. I too was frustrated by the manner in which the bout unfolded but Kevin Johnson was of a greater calibre than previous opposition. Despite a three week notice he put forth a decent performance. I am however very surprised to see Fury boxing with a renewed level of caution and being able to adhere to the strict instruction his uncle ordered. He employed patience when he needed to and recovered from some questionable moments when energy stores appeared low. He fought better when he pressed forth the action and executed combinations; however on numerous occasions this was lacking in his onslaught. I applaud him for some of the positive developments which were on display throughout the bout and understand that he too is a fighter with much to learn. Perhaps the engaging approach which he employed in the lower ranks could not easily be relied upon in this bout. However even in singing him praise, I hope that this revised Tyson is not going to rob us of the colourful and fearless Fury who has captured our attention. Although he is calling out for a Klitschko for his next bout, I can say with notable confidence that he is not yet ready for them yet, perhaps two or three more fights will see him best prepared for the storm ahead.